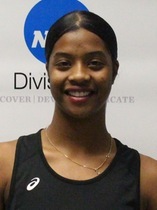 Yontz Sutton, J'auna James and their Thomas College Men's and Women's Track & Field teammates competed at the Panther Invitational at Plymouth State University. Sutton and the Men finished fifth as a team, while James and the Women finished in 12th. James would finish 14th competing in the Women’s 400 Meter Dash stopping the clock in a time of 1:11.56. James would run the third leg of the Thomas College Women’s 4x200 Meter Relay team that finished 10th with a time of 2:17.51. Sutton would run the third leg for the Thomas College Men’s 4x200 Meter Relay team that would finish 6th stopping the clock in a time of 1:47.32. Sutton would finish 4th in the Men’s High Jump with a top leap of 1.70m or 5 feet 7 inches. Sutton would also finish 7th competing in the Men’s Long Jump with a leap of 5.88m or 19 feet 3.50 inches.